Automated conveyor systems Nieros are designed for transportation of various products. They offer cost and time effective solutions for internal production processes of companies. Their main functions are to reduce work processes, diminish work injuries and improve productivity. Transport systems save money and time in production processes because they are designed in a way that products move along production line easily and quickly as possible. Material handling conveyors are modular and because of that, they can be integrated in Nieros hygiene and washing units. Clean and dirty items are transported from various working stations to washing and sanitizing machines and last stop in warehouse. Whole automated process goes the other way too. Because of modular system, different kind of automated transport lines can be combined to adjust moving speed and the number of heights of transport levels. All transport system solutions have digital control system and additional functions so production process gives superior performance. Nieros produces two types of automated transportation systems: for euro crates, pallet box, box, IBC containers transport and for product transport. Their benefits are: low energy consumption, efficient use of space, simple cleaning, optimized material flow, full customization, high capacity, compatibility with other Nieros machines, just to name a few. 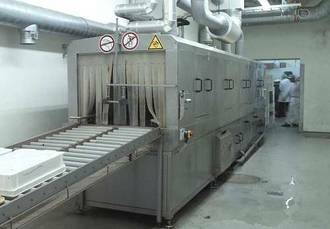 Flexible conveyor systems are the best solution for food processing industry. Transport lines for products are designed in a way to guarantee maximum profit with minimum labor. They follow principles of ergonomics and as a result they lead to work simplification, better comfort and higher productivity. Industrial conveyor systems have stainless steel constructions which are easy to clean and therefore comply with highest hygiene standards and quality requirements. 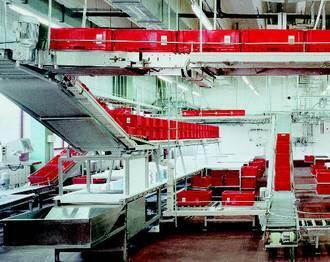 Conveyor systems make smart use of available space when they are organized in multiple levels. All transport lines are compatible with many Nieros products such as hygiene solutions and industrial washing and drying solutions. Production processes vary in many characteristics and when the space in production area is limited or organized on multiple floors, various vertical and horizontal transportation systems are the best solution. Nieros produces all kind of transportation lines and entire automated conveyor systems which are organized in many height levels to optimize available space while effectively transporting products or items to different levels. Vertical S type transporter is solution for production areas where euro crate transport would function best between different height levels. In case of clean crates, belt conveyor system can be placed under the main transport line for best space utilization. Vertical crate elevators are best solution when euro crates nedd to be transported from lower to higher levels and in opposite direction too. It is primarily designed for transportation of full crates from production line to packing station. Conveyor can be made of various belts or rollers. Nieros is a manufacturer of V – belt driven, motor driven or gravity fed conveyor systems. Designs of conveyor belt systems are: knuckle belt, vertical belt, plastic fabric continuous belt. Roller transporters are used for efficient transportation of empty or full euro crates, boxes, euro pallets and trays in various production processes. Clients can choose from different material (stainless steel, plastic) and dimensions (450 – 650 mm, adjustable height), drive modes so they can find conveyor solution that best meets their requirements. Slat belt conveyors are designed for transportation of various items such as crates, pallets, boxes and all type of packed products of raw food materials. They are motor driven and are available in various dimensions (100 – 1200 mm, adjustable height) which makes them perfect solution for any type of production process.